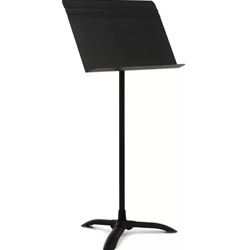 Longest lasting, most durable music stand made. Rugged, all-aluminum,lightweight desks are ribbed for extra strength. Baked-on, glare-free, black textured finish resists scratches and chipping. Easy, automatic no-knob friction-tilt neck delivers constant tension at any tilt position. Solid-brass bearings, greaseless heavy-duty chrome inner shaft, and the original counterbalanced "Magic Finger Clutch"™ provides one-hand friction grip. Secure at any height, even with a heavy load of music. Heavy-gauge, all-steel welded base provides excellent stability and requires minimum space on stage risers or in storage.